I sew mainly with cotton, often from reclaimed/recycled materials. Why sew with reclaimed materials when it takes so much more time and fabric is (relatively) cheaper than time? Because I think so much about things. For instance, I think about the energy, water and chemicals embedded into finished goods. Are they used optimally? Can their useful life be extended? I honor the makers and the materials by putting them to their highest use over and over again before destruction. How did we lose touch with the wisdom of our grandmothers? "Use it up, Wear it Out, Make it do...or Do without." Cotton is one of the most water and chemical-intensive crops, using up about 3% of the world's arable land and freshwater and consuming about 15% of the chemicals used in agriculture. Each pound of "conventional" cotton (enough for a adult t-shirt) is embedded with about 700 gallons of water and a third of a pound of chemicals! is it irrigated or watered by rain? Is this the highest use of the land and the labor? This is not an idle worry because children have been pulled out of school and sold into slavery in order to grow "fair trade" organic cotton at prices the first world is willing to pay. Moreover, cotton destined for wealthy nations is often grown in countries where food is scarce; the water, land and labor diverted to growing cotton could have been used instead to grow food. The water use of cotton has often great local impacts. In Central Asia, for example, excessive abstractions of water from the Amur Darya and Syr Darya for cotton irrigation have resulted in the near-disappearance of the Aral Sea. Every cotton T-shirt starts life in a cotton field, most likely in China, India or the United States. It takes anywhere from 700 to 2,000 gallons of water to produce about a pound of conventional cotton – enough for a single T-shirt. Cotton grown in the United States uses comparatively less water; however, about a third of a pound of chemical pesticides and fertilizers go into each pound of conventionally-grown American cotton. A new wave of research on "virtual," or embedded, water has given companies and governments new tools to track not just the water that they consume directly, but also the gallons that are embedded in everything from dishwashing detergent and Argentine beef to Spanish oranges and cotton grown in Pakistan. A cup of coffee takes roughly 35 gallons. A cotton T-shirt typically takes some 700 gallons of water to produce. A typical hamburger takes 630 gallons of water to produce -- more than three times the amount the average American uses every day for drinking, bathing, washing dishes and flushing toilets. The bulk is used to grow grain for cattle feed. Access to water: 1.6 billion people in the world -- one in four -- have to walk at least 1 km each day to get water and carry it home, or depend on someone who does. Just to provide basic water for a family of four -- 50 gallons -- that means carrying (on your head) 400 pounds of water, walking 1 km or more, for as many trips a day as necessary. Peak oil? Try peak water. It is estimated that the average Briton drinks between 2 and 5 litres of water per day and will use about 145 litres for cooking, cleaning, washing and flushing. If the embedded water used in the production of the goods people consume is also taken into account however the daily use per person in the UK may be nearer 3400 litres (Source: Waterwise). Britain and other rich countries depend heavily on importing hidden "virtual" water from places that regularly experience droughts and shortages, according a report published today by the Royal Academy of Engineering. Although the UK is notoriously wet, it is estimated that two-thirds of all the water that its population of 60 million people needs comes embedded in imported food, clothes and industrial goods. The result is that when people buy flowers from Kenya, beef from Botswana, or fruit and vegetables from parts of Asia and Latin America, they may be exacerbating droughts and undermining countries' efforts to grow food for themselves, say the authors. According to the report, the average Briton uses nearly 3,000 litres of imported water a year. One kilogram of beef needs 15,000 litres of water to produce, more than 10 times the amount required to produce the same weight of wheat. A T-shirt requires 2,700 litres. Small changes from many people can have a big impact. I drink one cup of coffee per day and then switch to tea and water. I eat beef about once a month instead of weekly. My husband's worn-out shirts are sewn into clothing for myself or for children. 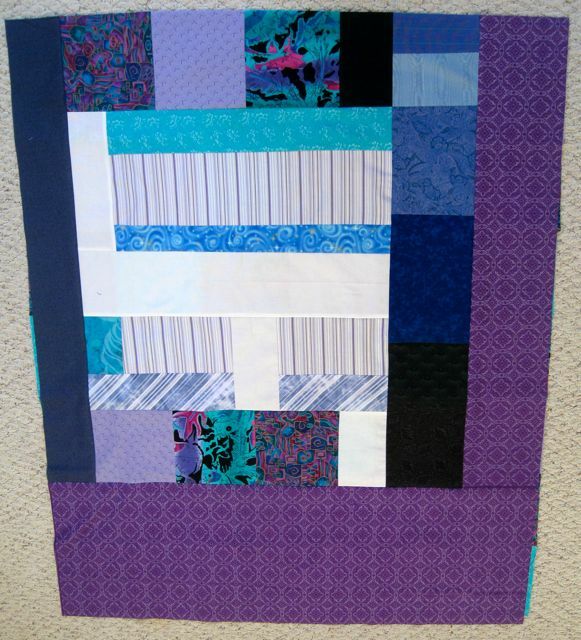 Scraps can be turned into pieced quilts. Scraps too small to use can be dampened and used for quick clean ups (instead of paper towels) before they are thrown into the trash. I could send the dozens of promotional t-shirts from events that our family has attended over the last few years and never wear to Goodwill and turn them into someone else's problem. They could languish in the store for months (everyone here has too many of these t-shirts) or they could be sent halfway around the world to cloth some other family , incurring shipping energy costs. After visiting Tanzania and seeing how western t-shirts worn with locally made cloth wrap skirts free up arms needed for work, I feel OK about sending some of my shirts overseas. But, mostly I try to put them to use in place as I will show in a photo tutorial on Monday. These facts and figures deserve to be really well known. Cotton is often portrayed as a good, eco-friendly choice. I have been avoiding buying new cotton this year and have enjoyed more creative sewing projects than ever before - I love linen and I enjoy refashioning and I have even started darning my socks. Best of all, I am getting through my quilting stash. Thanks for putting this information out.